OUR PUBLISHER WRITES: As I walked towards this scene I had one of those flashes of novelty like reverse déjà vu. I have lived in the USA, which is so different from the land of my birth and yet at the same time so familiar, for more than two years now. Many things have happened, and my previous life seems so far away that it is like a parallel universe. However, occasionally I still get these revelatory experiences, when the lenses of perception shift making seeing and experiencing everything seem as though it was the first time. 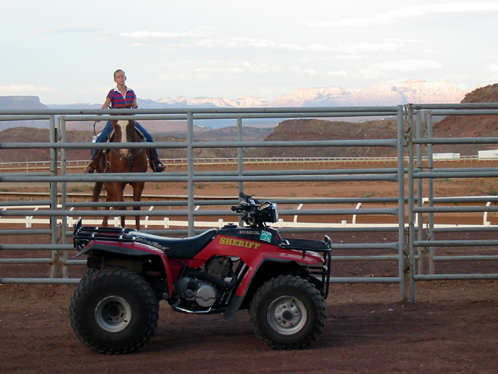 I know I am elsewhere when I see that the Sheriff rides an ATV to catch those pesky horse rustling varmints! It's almost as bizarre as that line in the old Roger Miller hit song 'England Swings Like A Pendulum Do' that goes 'Bobbies on bicycles two by two'. One day, perhaps, I will become so Americanized that light switches toggling UP for ON will seem intuitive. American actress (1968- ). Anyone who recognized Friday's subject will have no problem with this one: they co-starred in a TV series. Their birthdays are only an intervening day apart, but at only 365:1 this is not such a remarkable coincidence, especially at a time of year when births peak. This gal must have 'big hair', because this is the first time that a featured caricature has been as wide as it is high. She lived in London, England, UK from age 2 to age 11 and on her return to Grand Rapids, Michigan, USA, she was teased for her English accent. This entry was prepared using an IMDB (Internet Movie Database) feature. It has been a while since I featured one of Tony Richards' photographs. The one that took my fancy was this picture of Elterwater, which is one of the smaller lakes in the English Lake District. This delightful jewel like body of water feeds the larger lake of Windermere from the west. Local artist Judy Boyes has her studio in Elterwater village. Her web site shows many of her delightful prints of Lake District landscapes, which may be easily purchased from the site or the studio. Should you wish to view Judy's work, the web site has a clear wayfinder to the studio.